We cheered when author Sharon Creech won the Newbery Award for Walk Two Moons, and applauded her Newbery Honor Award for The Wanderer. We went berserk for Love that Dog and voted it Hicklebee's Book of the Year (Fall 2001). We're so excited she's coming to Hicklebee's to tell us about her newest book, The Great Unexpected. Sharon Creech , The Unfinished Angel. Author: Sharon Creech is the author of the Newbery Medal winner "Walk Two Moons" and the Newbery Honor Book "The Wanderer". 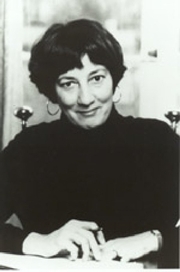 Her other work includes the novels "Hate That Cat", "The Castle Corona", "Replay", "Heartbeat", "Granny Torrelli Makes Soup", "Ruby Holler", "Love That Dog", "Bloomability", "Absolutely Normal Chaos", "Chasing Redbird", and "Pleasing the Ghost", as well as three picture books: "A Fine, Fine School"; "Fishing in the Air"; and "Who's That Baby&quest;" Ms. Creech and her husband live in upstate New York. What: Sharon Creech will talk about her New Book, her life, her work, answer audience questions and she will autograph copies of her New Book purchased from Rainy Day Books, on our website and / or at our Author Event, that are accompanied by a Stamped Ticket. Sharon Creech promotes Hate That Cat. Sharon Creech is currently considered a "single author." If one or more works are by a distinct, homonymous authors, go ahead and split the author. Sharon Creech is composed of 8 names. You can examine and separate out names.